How was everyone's first week of school/work? August has been such a busy month for me as I'm paying back for my time off this month! I'll be going away for a week and a half - be sure to follow me on my Instastories for details! 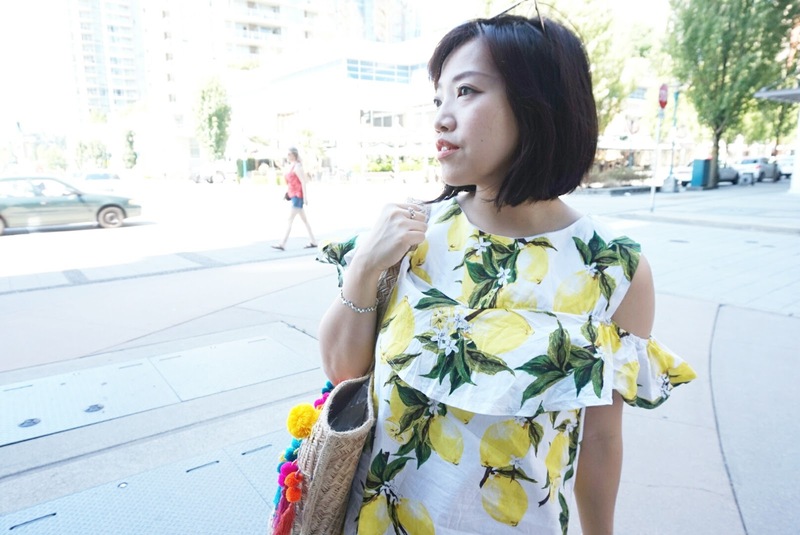 I love fruit prints on clothing - especially lemons, because they make the whole outfit appear lively, happy and sweet. 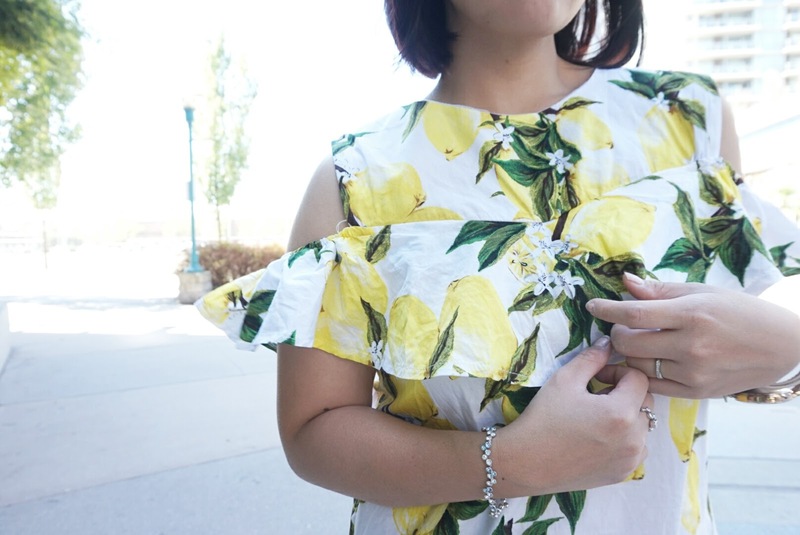 Did you know that a lemon tree produces lemons all year around? Although most fruit prints appear summery, I thought I would experiment with lemon prints in early Autumn while it's still warm. Cold shoulder dresses are perfect for transitioning into Autumn. They feature the sleeveless design yet cover the upper arms modestly with a partial sleeve. They are great to add coverage on an outfit making it flattering for those who aren't as confident with showing off their arms. They are easy to carry and works easily dressed up with pumps or down with flats. 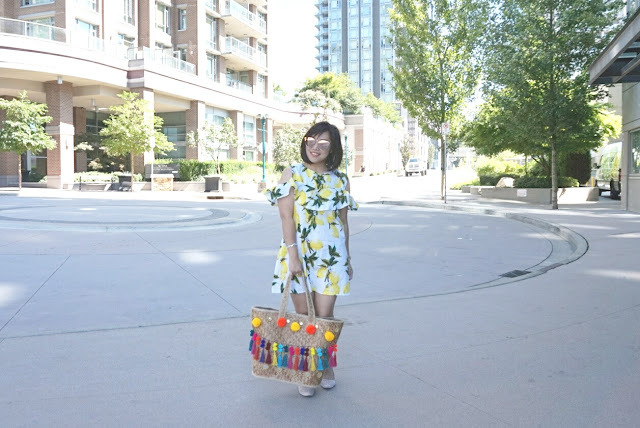 I do admit my choice of bag to pair with a lemon printed dress looks quite summery. 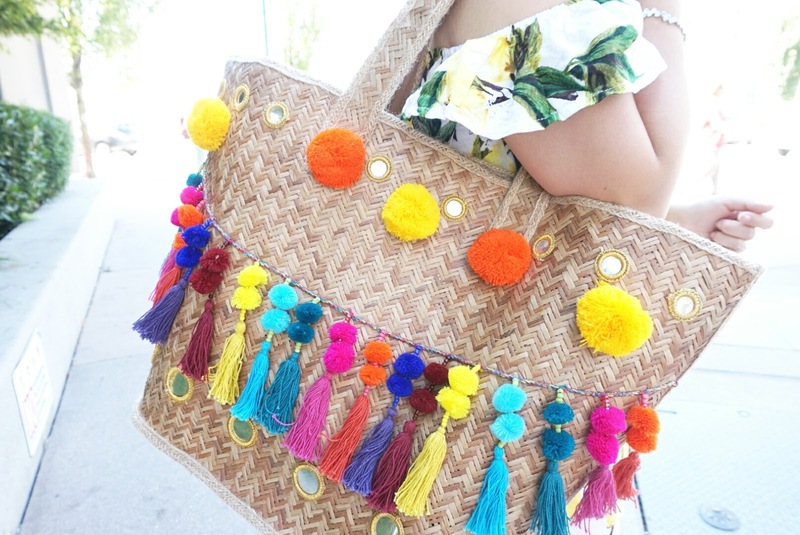 The colorful pom pom and tassels details on the bag are very festive and so much fun! On the other hand, the tassels also kind of remind me of lanterns from the Chinese Mid-Autumn Festival (it's also coming up soon!). How is that for a twist? When the weather gets cooler, I plan to make this outfit more Autumn appropriate by layering with a cardigan or bomber jacket. I think an Autumn color like a dull orange, navy green or black would match very well. I would also don a simple black cross-body bag or tote to go along with a darker color theme. Perhaps finishing off with studs details for a punk rock look! Do you like fruit prints? Which one is your favorite and what are your thoughts on wearing them all year round? Share with me me in the comments below! Till next time! Comes September means summer is ending :( Hopefully the sun will stay put for a while longer before the real "Raincouver" comes back! At least it's still quite warm out. Although I've owned this bright yellow top ﻿for a while now, I still wear it a lot for its excellent quality and design. I thought the cute shoulder detail that bunches up in the front is quite unique and different. 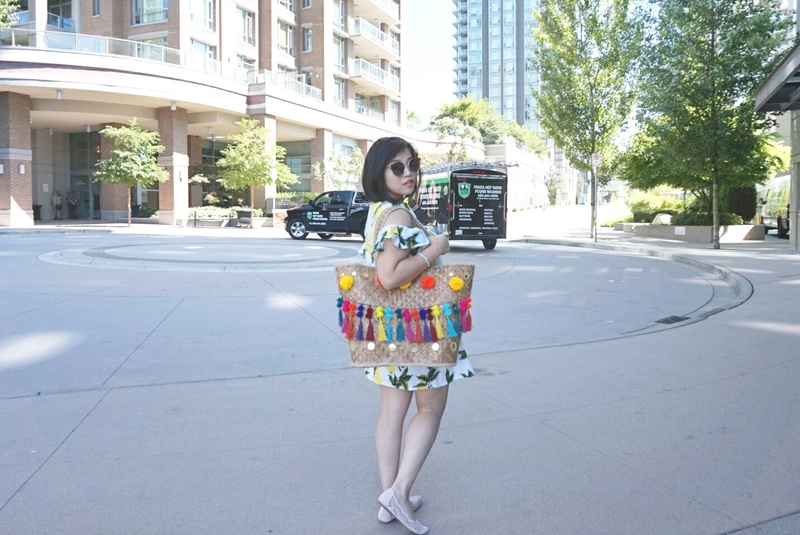 Since I'm so not ready to say goodbye to summer, I decided to play with bright colors - yellow. A bright version of Autumn color in my opinion! 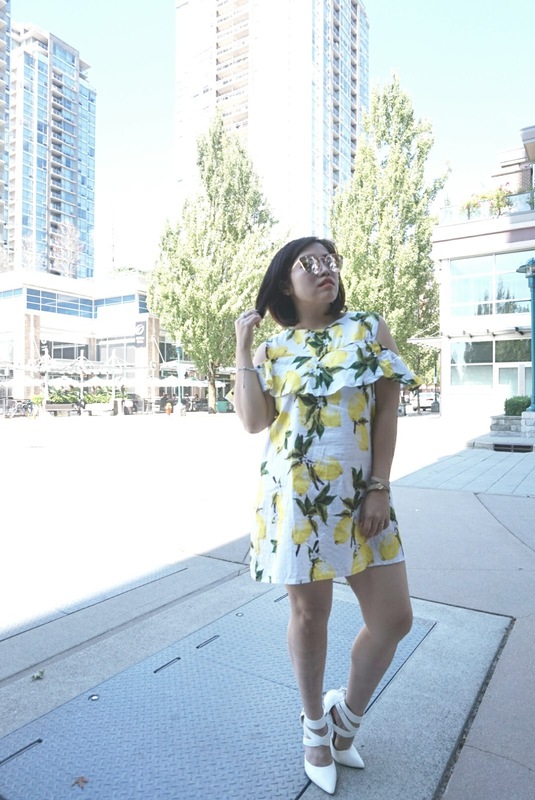 I don't believe bright yellow is a definite summer color. 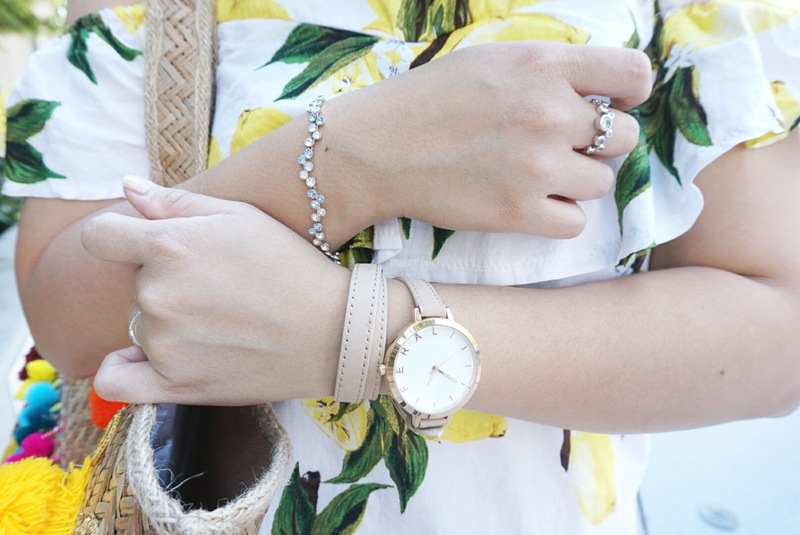 With the right pairing and layering, Yellow can be worn all year round. For example, if you like darker outfits for the colder days, all you have to do is let it peek out just a little under a darker colored poncho or cardigan. You can also opt for a darker yellow like mustard yellow. When the weather begins to cool, I can easily transition the top into Autumn by adding layers like thin flowy shawls and cardigans. I can also don the gypsy style with a midi A-line skirt and cowboy boots; or rock the punk look with skinny jeans and studded ankle boots. The options are endless! Are you transitioning into your fall wardrobe yet? I'd love to hear about how you are doing that! Leave a comment below to tell me about it! Till next time!